It’s Your Day in the Sunshine, Lurkers! 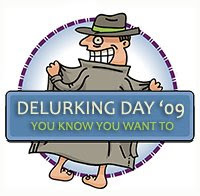 Happy Delurking Day to ya! I had no idea that it is Delurking Day until I saw this helpful tweet from Mr. Lady, and might I add “Thank Goodness for National Delurking Day!” Why? Because I am trying my little heart out to get some stuff done around my house and this will be a nice little quickie post. Yay for me! Did my magical convincing skillz work? I hope so. Anyway, regardless of whether you’re a regular non-lurker, a regular lurker, or you just stop in now and then, I really appreciate you: Thanks for coming to the Scrawl! I’m not sure if I qualify as a lurker. I’m an occasional commenter but a fairly recently-added faithful reader. Anyway… on this day above all, you need comments. So here’s my comment already. I’m not a lurker, but I figured I’d comment anyway. 🙂 Pretty soon we’re all going to be buried under snow. YUCK! I can’t believe that people would read this drivel; I mean, really. I check each and every day to see how many ingrates have come by to spout off on your inane ramblings. Nobody cares. Least of all me. That’s why I check everyday; to confirm my suspicion that people will fall for just about anything. By the way; could you re-post that Giant Hamburger thing you did? It’s not for me; of course, but some of your sheeple are probably too lazy to search for it and too embarassed to ask. I’ll be back tomorrow to laugh at you all, but don’t expect to comment again. Ever. And don’t call me a “lurker”, it sounds dirty and vile; like some know it all who only comes out of the shadows when it’s comfortable for them. I DO have a life, you know. I do. I don’t know if I qualify as a lurker or not, but I love reading your posts! Did it work???? I wanted to jump into your lap and lick your face. Like a puppy, not a freak. I’m not sure if I follow publicly then am I still counted as a lurker, hmmm, anyhow delurking to say thanks for the writings, will continue following and probably lurking as the kids seem to choose reading your blog as the time to kick up a fuss! OMG! These comments are so funny! Just came by, as usual, to give you smootches! Mwah, mwah! I have to confess that I have never been as confused by an anonymous comment as I am by that one. “I hate you, but I’ll keep reading you every day, and can you help me find ( * ) post”? You caught me. I’ve been lurking too. QuJaBaKa: Thanks for reading! (still!) I wonder why your kids do that…they must be NORMAL! Ha ha (Kids always get crazed when parents are trying to take a few minutes to themselves, don’t they? Mr. Lady: Don’t be confused. My super-investigative skillz allowed me to figure out that ANONYMOUS is actually the always witty and creative Nukedad! Michelle: Sure, I love comments! I’m no sheep! More cow shaped, really…. i had no idea it was delurking day… hm. Previous post: Never Underestimate the Memory of a Small Child.